26 Marion Iowa March 10 / 19 Cary Club met with Mrs Reickert at the usual hour. Club was called to order by Pres. Mrs McKean. Roll call responded to by quotations of wit and humor. 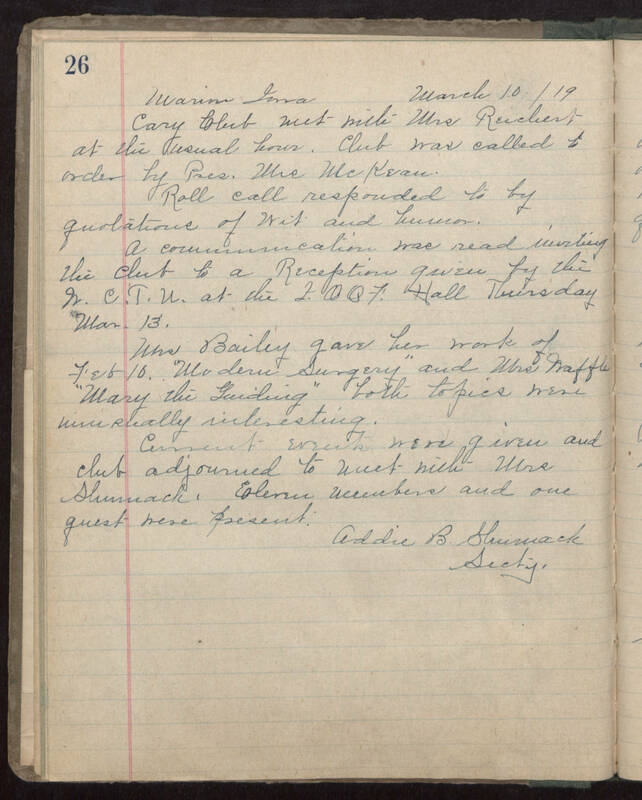 A communication was read inviting the club to a Reception given by the W. C. T. N. at the [illegible] Hall Thursday Mar. 13. Mrs Bailey gave her work of Feb 16. "Modern Surgery" and Mrs Waffle "Mary the Guiding" both topics were were really interesting. Current events were given and club adjourned to meet with Mrs Shumack. Eleven members and one guest were present. Addie B Shumack Secty.